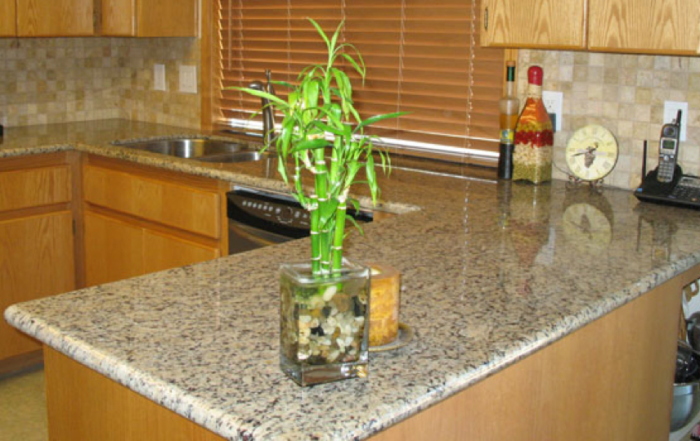 At Sunset Granite, we pride ourselves on our quality of work and customer satisfaction. A professional installation requires precise measurements, so that the new countertops will fit perfectly in their position. Exact measurements are needed to ensure a proper installation of the faucet and sink. 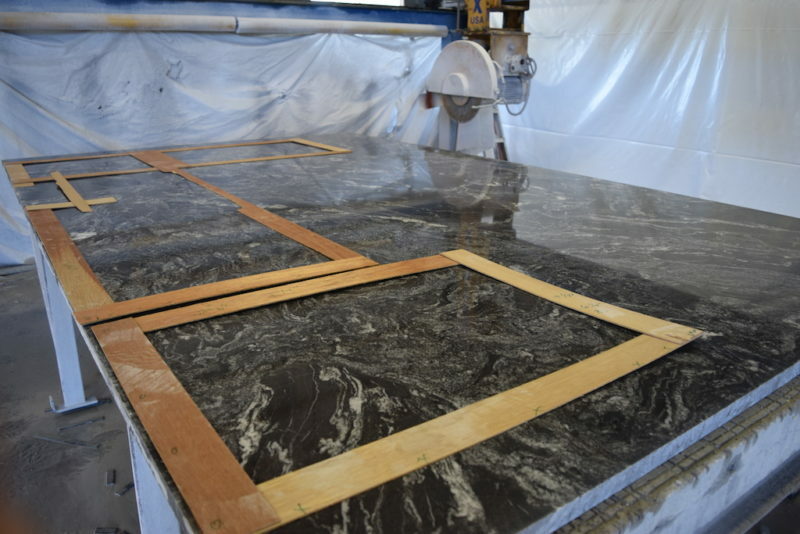 There are many factors to consider when replacing your countertops and a very important one is a well-made template. If you are starting from scratch, it is important that the cabinets the top will be sitting on are permanently installed and level with an 1/8 of an inch for every 10 feet allowance. If the lower cabinets are just pushed in place there is a possibility the shift of the cabinet can throw off the placement of the countertop. It is important the sink and all the appliances be present on the day measurements will be taken. The countertop template will be measured to a very tight fit so it is crucial that the appliances and sink be inspected for defects or damages, for example if a sink has a rim too small for the countertop you will have time to address the problem and be prepared for installation of your countertops. 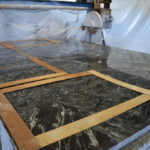 If you have existing countertops, we will make the template over the current counters without having to remove them. This allows you to have full functionality of your space until the install day. It is still recommended that you have chosen your sink and appliances so that we can cover every concern there might be. A template can be created using two different materials, the most popular one being 1/8-in. thick plywood also known as door-skin. The plywood comes in a 4ft. x 8ft. sheet usually used to face hollow-cored doors, it can but cut into strips that will be hot-glued to construct the template. The door-skin is an excellent candidate for a countertop template, as a rigid material it will hold its shape but it is also light enough for easy transport and placement on the counter stock. It’s a popular option because is glues quickly and holds its shape well, strips can be cut with a utility knife alongside a straight edge, and it is cost effective. A template made from door-skin will need to be transported by a truck because it cannot be rolled up. An alternative to door-skin would be plastic templating strips. The plastic templating strips are also glued with quick-drying solvent glues or low VOC adhesives, but are flexible enough to be rolled up making it a little more convenient. Convenience comes with a matching price. A countertop template usually starts with a long strip along the front and rear of the counter. We make sure the wall is straight and if it is not we note any irregularities on the template. The wall must be parallel to the front of the counter and any end walls are measured to insure they are perpendicular. A common gap of 1/4in. 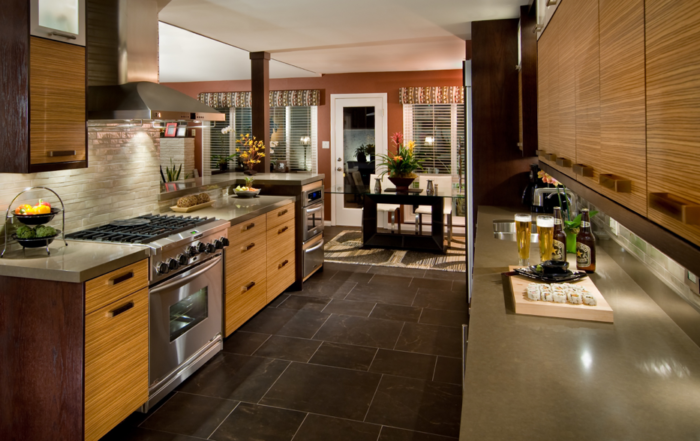 between walls and countertops is included in the measurements along with any irregularities or custom requests. Written on the template will also be notations for the edges. Edge notations will include edge detail, edge thickness, and overhang. All edges include a cut-out for an under-mounted sink. A well-made template will also include all cut-outs for appliances and custom sections. The back-splash is also measured out to assure clearance of any window openings and designated spots for receptacles and switches. 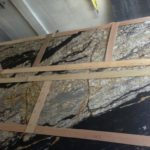 It is important that the template be made precisely, and the professionals at Sunset Granite have the knowledge and experience to perform these tasks to the highest level of quality. 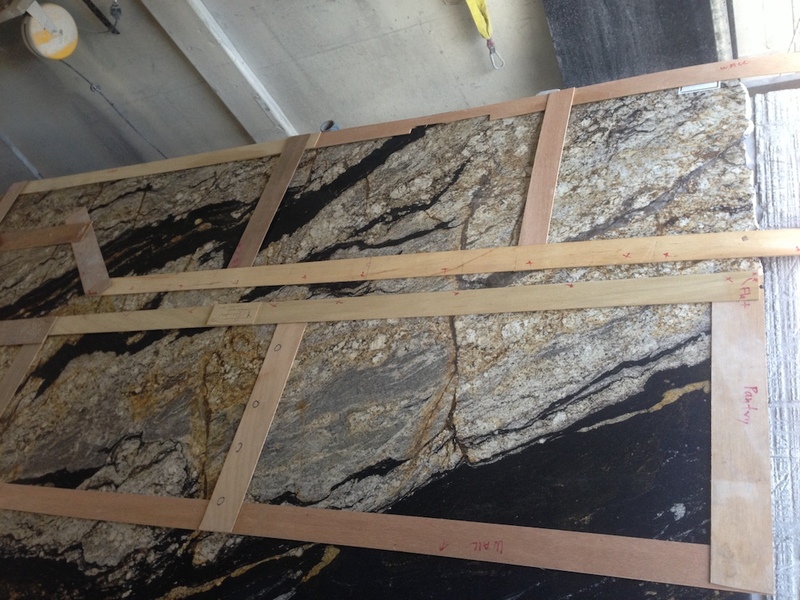 A clean professional install of our granite countertops starts with a professionally made template.